Martin Amis is regarded by many critics as one of the most influential and innovative voices in contemporary British fiction. Amis is often grouped with the generation of British-based novelists that includes Salman Rushdie, Ian McEwan and Julian Barnes. His latest book is "The Rub of Time: Bellow, Nabokov, Hitchens, Travolta, Trump: Essays and Reportage, 1994-2017". 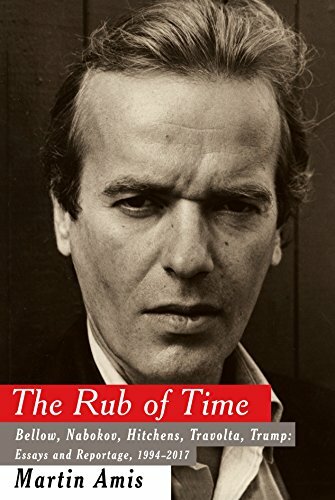 MARTIN AMIS: Famously, Nabokov said – or infamously, perhaps it's now a synonym for that too – said, "There is only one school of writing, that of talent." And it's axiomatic that you can't teach talent. Of course you can't. But what you can do is instill certain principles, and the avoidance of ugly repetition is very important. Repetition has its uses and anything is better than trying to avoid repetition through what they call "elegant variation." This is an example from a biography of Lincoln: "While in Chicago he appeared to back concessions to the South. In New York he seemed to support…"
You know, there's no point in using a different word when there's no change in meaning. And that's just something that the writer was taught when they were 12 – never to use a word twice in a sentence – and they've become terrorized by that and then addicted to a new "ingenuity" where you avoid it. But I'm talking more about sounds and rhythms. The Nabokov novel we know of as "Invitation to a Beheading" was originally called – not for very long – "Invitation to an Execution". Now Nabokov said, "Of course I avoided the repetition of the suffix so chose to call it 'Invitation to a Beheading' rather than 'Invitation to an Execution', which is sort of rhythmically ugly." You've got to think about the bits of the word as well as the word in its totality. Avoiding repetition of prefixes and suffixes as well as rhymes and half-rhymes, unintentional alliteration, et cetera, can be achieved by anyone simply by using a dictionary and a thesaurus. People think thesauruses are there so you can look up a fancy word for 'big' or a fancy word for 'long'. That's not what a thesaurus is for, in my view. A thesaurus is – you come to a point in a sentence and it's usually towards the end of a sentence where you're unhappy with the word you've chosen not because of its meaning but because of its rhythm. And you may want a monosyllable for this concept or you may want a trisyllable. So you look in the thesaurus, you find a simile that has the right number, you know, for the whole sentence to maintain its rhythmical integrity. And you just do that by going to your thesaurus. And also going to your dictionary. Do not use words against the derivation. For example, dilapidate. It's fine to talk about a dilapidated building but not fine to talk about a dilapidated hedge, because dilapidated comes from 'lapis', which means 'stone'. So a really careful writer will make sure that they're not visiting an indecorum on the word's derivation. So it's very labor intensive. I mean it takes a long time, sometimes, to get your sentence right, rhythmically, and to clear the main words in it from misuse. And all you're winning is the respect of other serious writers. But I think that any amount of effort is worth it for that. And it's easy enough to find alternatives without committing the dreadful sin of elegant variation. And it just involves you in looking at reference books for a couple of minutes. I look in the dictionary, I check words in the dictionary a dozen times a day at least. And you find out very strange and interesting things. For instance, 'widow' originally meant just 'empty'. It's an adjective meaning empty. Now that's part of your – when you look up a word in the dictionary you own it in a way you didn't before. You know what it comes from and you know its exact meaning. And whenever I do that – and I do it all the time – it's as if you feel a gray cell being born in your head, a little addition to your store of knowledge. And while all the other cells are dying in a kind of genocide of the aging process you can restore it, and that's what it feels like. And it fortifies you.